Since my friends, acquaintances and colleagues all know I’m a writer, I’m often asked how they can best improve their writing. While there is an endless collection of tips and tricks one can employ to become a better writer, there is really no replacement for practice. Writers write. The more you write, the better you get. Finding the motivation to write however can be a challenge for some. If writing is not a part of one’s daily business or personal life, a suitable carrot must be dangled in front of someone to motivate them to write. Some suggest the use of a personal journal and I think that’s great. My only issue with using journals as writing practice is that it’s not outward facing writing. In other words, journals are only meant to be read by the writer and thus sloppy writing will be tolerated. You need writing that is meant for the eyes of others. I suggest thank you letters as one great learning mechanism. Here’s why. 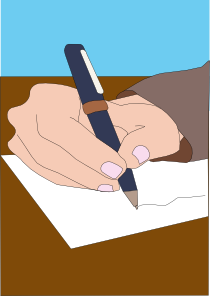 Writing thank you letters to those people in your life you wish to thank fosters gratitude, makes the recipient feel good, and at the same time offers you a means to practice and improve your writing because you want the letters to be clear and beautifully written. It’s a positive all around and thus can properly motivate you to practice writing. You might even go so far as to make writing thank you letters a daily, or at least regular, practice. John Kralik did this when he undertook the task of writing a thank you letter to someone in his life every day for a year. Kralik documents his thank you letter journey in his book 365 Thank Yous: The Year a Simple Act of Daily Gratitude Changed My Life which has garnered significant praise. So, who in your life do you want to thank? Start writing that thank you letter now.